Author and philosopher Noam Chomsky has challenged a hypocritical approach concerning US drone attacks and the bombing of a media organization in Yugoslavia in the light of the outburst following the Charlie Hebdo attack. In a blog post first published by CNN on Monday this week, the noted academic raised questions about America’s interpretation of the terrorist attack on French magazine Charlie Hebdo earlier this month that left 12 people dead. While the attack was quick to be condemned as an act of terror by the US, Chomsky wrote, the American public has all but totally ignored other recent atrocities, including some it’s even responsible for. But of particular concern, Chomsky wrote, is the absence of interest in the west after the NATO bombing of a Radio Television Serbia in 1999 and the 2011 outburst committed by Anders Breivik, an extremist Islamaphobe, in Oslo, Norway. “There were no demonstrations or cries of outrage, no chants of ‘We are RTV,’ no inquiries into the roots of the attack in Christian culture and history,” Chomsky wrote about the Serbian incident. Chomsky believes the US is currently in the midst of its own campaign of terror, which rivals anything the French have experienced as of late. 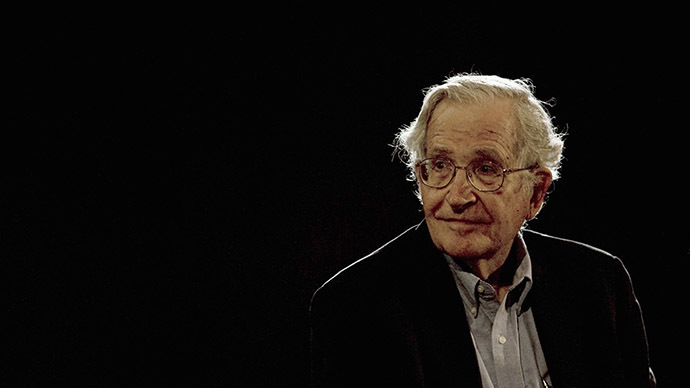 Chomsky’s latest remarks ring similar to what he told RT during an exclusive interview in 2013. “The drone campaign is by far the biggest terrorist campaign in the world. It’s never described that way but that’s of course [that is] what it is. Furthermore it’s a terrorist generating campaign. From the highest levels and most respected sources it’s recognized that the drone attacks create potential terrorists on quite a substantial scale. Therefore it’s a threat to US security, apart from being a terrorist campaign in itself, and almost never discussed,” he said. Now in the wake of the Charlie Hebdo tragedy, Chomsky writes that it’s only right to consider terrorism for what it is, and now what a particular point-of-view portrays it to be depending on the persons involved. “Contrary to the eloquent pronouncements, it is not the case that ‘Terrorism is terrorism. There's no two ways about it.’ There definitely are two ways about it: theirs versus ours. And not just terrorism,” he wrote.